Following the post by the Moroccan Primate Conservation about how close tourists can get to Barbary macaques in Ifrane National Park, I felt the need to tell you the consequences and risk that such behaviour may lead to. Every day we observe the behaviour of many tourists interacting with monkeys at the tourist group at our field site. A large number of tourists, if not 100% of them, do not seem to realise the potential risk that macaques could represent when people act in such irresponsible behaviour. I can give you thousands of examples about these situations. Many parents want to take pictures of their children, even babies, close to a monkey. When I say close I mean less than 1 metre from an adult male monkey which is often bigger or the same size as the child. The parents often encourage their child to give food to the monkeys while they take a picture. However, people get regularly scratched on their hand by a monkey who tries to reach out the food. Link: Video of Pepito being petted by 2 young children while their father takes a picture. See images for the outcome. 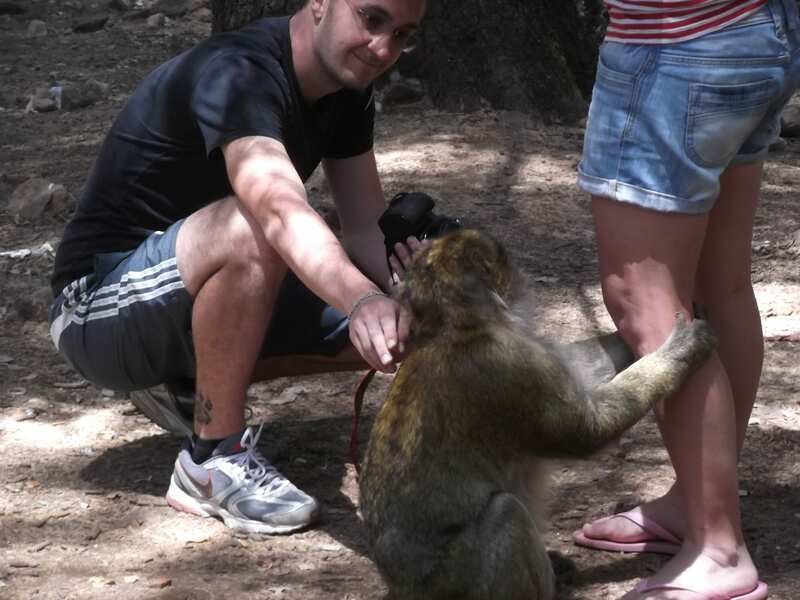 We also see many tourists who try to touch the monkeys and get aggressed. Tourists touching and feeding a young adult Barbary macaque. Results: open mouth threat and scratches! People often told me that these monkeys are not dangerous; they are domestic, so there is no problem to approach them closely, even touch them. It is true that I have never seen a fatal Barbary macaque aggression to a human yet. However, these animals are not domestic; they are wild monkeys who were habituated to human presence because of the food supplied by tourists and local people. These animals are not vaccinated and do not have any health checks. Hence, disease transmission is a real risk that tourists subconsciously take when they interact with these animals. A simple scratch might be a real health risk. A few months ago, a sub-adult female from the tourist group jumped on my back while I was following another monkey for behavioural data collection. 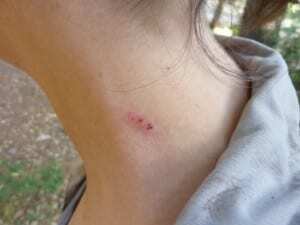 In several years of working with wildBarbarymacaques, it was the first time that I was physically aggressed by a macaque which left a bleeding scratch on my neck. I believe that the frequent close interactions with tourists unfortunately lead to this kind of aggression. Although the injury was not serious, the risk of disease transmission still needs to be taken into consideration. It was also an interesting experience to know how Moroccan health care would treat this case. Scratch left by the sub-adult female. Nice vampire bite! These are just few examples of the risks tourists face. In the next post, I will introduce to you what can be the risks to the monkeys. ← New food on the diet: rabbits and birds!